MOSCOW, August 10. /TASS/. Russian President Vladimir Putin and the permanent members of the national Security Council have discussed new possible US sanctions against Moscow, Kremlin Spokesman Dmitry Peskov said. According to him, "there was a discussion of new unfriendly steps on the part of Washington, which may take the form of trade restrictions." The meeting’s participants "emphasized the complete illegitimacy of such actions from the standpoint of international law," Peskov added. The meeting also "discussed routine issues concerning the country’s social and economic development." 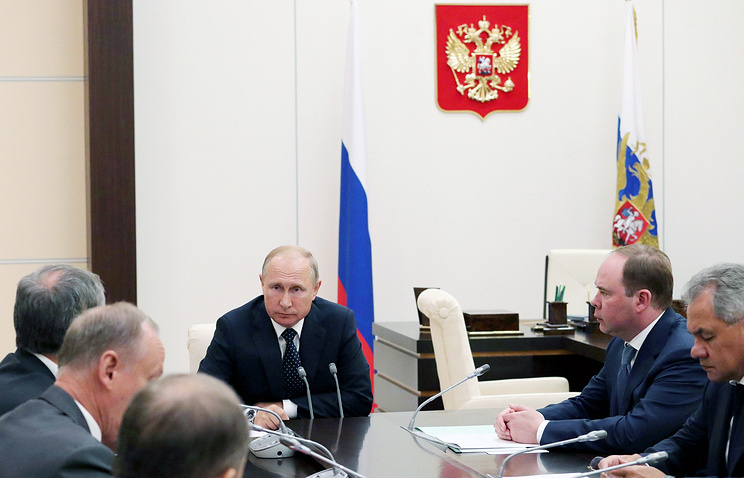 The meeting involved Russian State Duma (lower house of parliament) Speaker Vyacheslav Volodin, Kremlin Administration Head Anton Vaino, Security Council Secretary Nikolai Patrushev, Defense Minister Sergei Shoigu, Federal Security Service (FSB) Director Alexander Bortnikov. On Wednesday, the US Department of State said in a statement that Washington was imposing new sanctions on Moscow over its alleged involvement in the poisoning of Sergei and Yulia Skripal in the British city of Salisbury. The first round of sanctions will take effect on August 22, while a second round may be introduced in 90 days in case Russia fails to meet certain conditions, the State Department said. Moscow has on numerous occasions rejected all the allegations about its involvement in the Salisbury incident.